We recently had the privilege to interview Catholic author Josh Baker. 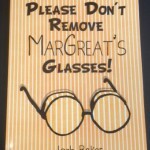 Josh was the grand prize winner of the Xulon Press Christian Choice Writing Contest, and chose to have his wonderful book Please Don’t Remove MarGreat’s Glasses! published. This book is Catholic fiction, which I believe is a very underdeveloped genre that could potentially be a wonderful tool to evangelize with. We touch on that topic in this interview, as well as others including Josh’s inspiration for his book, Josh’s faith, the Xulon Press contest, and even Josh’s favorite Biblical verse. This is a great chance to learn about a truly unique and terrific person! By leaving a comment on this post you are also entering yourself to win a signed copy of Please Don’t Remove MarGreat’s Glasses! The contest will be open until this coming Friday (02/01/13) and a winner will be selected/informed by 5 PM of that day. 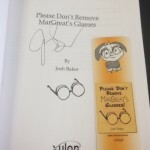 To watch a video trailer about Josh’s book Please Don’t Remove MarGreat’s Glasses you can visit his blog at MarGreatsGlasses.com. You can also find links to follow Josh on Facebook, Twitter, and Google+, as well as to purchase the book! Your book Please Don’t Remove MarGreat’s Glasses! came out in November of 2012, what was your inspiration for this book? The main inspiration for, Please Don’t Remove MarGreat’s Glasses! was my desire to provide hope and clarity to young people entering adulthood who are questioning their faith, have abandoned it altogether, or are distressed by secular messages contrary to their beliefs. Is there a reason that you chose to write this book for the intended audience of young adults? I feel it is critical to evangelize to young people, and to do it in terms they can relate to. The enemy certainly knows this as evidenced by today’s mainstream television programming and popular music. In this digital age, we cannot be complacent and rely solely on traditional means of evangelizing. The book does a great job addressing common misconceptions and misrepresentations of our faith in contemporary language and presentation which young adults will find credible and engaging. You were raised Catholic, but abandoned your faith after high school for some time. Thankfully you have returned to the Church now. How has this experience affected you as a person? Being someone who was once seduced by secular thinking, I have an intimate understanding of the mindset of those who reject our faith. When the Lord woke me from my stupor, I was as far from God as I had ever been. I held harsh, intolerant positions, backed by self-serving motives. If you were to tell me three years ago that I would today be an active, repentant disciple of Jesus Christ, I would have scoffed and sent you on your way. Knowing that God loved me, even when I was disrespectful and disobedient – that He loved me so much that he pulled me out of a ditch – has been an overwhelming, life-changing experience. When I encounter a spirited non-believer, my heart bursts with compassion because I’ve walked in those shoes and I know God has great plans for them if they would receive Him. My reversion back to Catholicism has brought about a tolerance and love for my follow man that I never had before. My experience has made it clear to me that Jesus wants a personal relationship with every living soul, especially those in most need of His mercy. Do you reflect some of your own personal struggles with faith in Timothy (the main character of Please Don’t Remove MarGreat’s Glasses!)? Like Timothy, I am very fond of science and technology. And similarly, I developed an attitude that one needed to choose between science and religion. This attitude is prevalent in today’s scientific community, which I find very odd. You’d think that as one unraveled the intricacies of the human genome, studied the interoperability of the circulatory, skeletal, muscular, and nervous systems, analyzed the uniqueness of our fingerprints, witnessed human reproduction, that they would be left in awe – not denying the creator. It was more convenient (for my lifestyle) to defer giving credit to God when I could lean on the convenient assumption that all would be explained by science – eventually. Timothy exhibits a similar attitude. You were the Grand Prize Winner of the Xulon Press Christian Choice Writing Contest. How did you come across the contest and what helped you to win it? My whole life, I have always loved to write. After my renewal of faith, I often recorded the day-to-day graces I experienced. Late-night, after everyone was in bed I’d meditate on whatever had transpired that day. During one of these late-night reflections, the character Timothy Clement, and God’s plan for him came to me. Over the next few weeks this vivid story of Timothy’s journey of faith flowed out. Before I knew it, I had a lot of unexpected material. I wasn’t sure what I would do with it – in anything. Self-publishing was gaining traction and so I did a basic inquiry into what options were available. I quickly realized that self-publishing required a significant budgetary commitment that I was not in any position to make for casual late-night ramblings. Several months later the representative who had answered my inquiries about publishing opportunities at Xulon Press contacted me regarding a Christian Choice Writing Contest. I decided to enter one of my short stories, but ultimately, I did not win, or even place for that matter. In April of last year I entered another Xulon Christian writing contest with a short Easter story. I had come home that day around six p.m. and saw an email in my inbox announcing that the contest was ending that same evening at midnight. I figured I might be able to crank out a short story in time – but then I noticed that the deadline was six p.m. Eastern time leaving me just three hours! I hunkered down and got to work on a short Easter story. I ended up submitting my entry just minutes before the deadline- with very low expectations since I hadn’t adequate time to polish it. The next morning I received a call informing me that I had won the Grand prize which was a book publishing package! I just about fell off my chair! There truly was no limit to the Lord’s mercy. Over the next four months I finished assembling the book and submitted the completed manuscript for production in October of last year. Do you have any advice for Catholics who are looking to get more involved with writing? Write more Catholic fiction! Catholic bookstores are filled with many wonderful books providing important teachings about our faith. We are very fortunately to have such an abundance of Catholic resources available to us. However, I would love to see the anemic genre of Catholic fiction develop and spread the message of our faith to a broader audience. In this year of faith Pope Benedict XVI has called us to not only rekindle our relationship with Jesus, but also share the good news of the Gospel. I think Catholic fiction is a worthy manifestation of the New Evangelization. If you could choose only one Biblical verse as a favorite, which would you choose and why? 1 Cor 12:4-11 because it shows how God has a plan for each of us. He has blessed us with unique talents that allow us to be instruments of His will, if we choose. What can we expect next from Josh Baker? I am currently working on a series of MarGreat comic strips for children learning about their faith. They are a humorous, but tactful attempt to engage young people and drive home Catholic fundamentals. Additionally, I am working on a new faith-based mystery that explores the ethical conflicts faced as new advances in genetic-engineering are achieved. It will have you guessing right up to the end! Next ArticleShould We Pray for Our Desires or God’s Will? Thanks for this interview! I’d love to be entered to win the signed book. What an insipiring interview! Amazing what God will do with and through us when we surrender our wills to His. Sounds like a great read. Congratulaions! I have recently been considering writing a book. I am a nurse practitioner and a catholic and have several ideas, one in particular that keeps popping up in my mind. Reading your interview gave me encouragement to recognize that if this is what God is calling me to do, that somehow he will make it happen. Good luck in your future endeavors. I agree with Josh’s feelings about Catholic fiction and Evangelization. I’ll be looking for the new faith-based mystery! Thanks and God bless you. Since i personally know this wonderful man, please give the signed book to another reader. That being said, however, his interview and his writing truly depict the man behind the story. He is an inspiration to all of us who know and Love him. Looking forward to his next and future books. God did not assign me this talent but gave something else which I do best to help share the faith…….I am now teaching children catechism. Thanks for a great interview. What a wonderful way to find out more about this man of Christ. Thank you Josh for sharing your talent with the rest of us and especially with the Catholic youth. God bless you on your writing journey. Teaching tools for kids and adults is what we need today… May the Lord continue blessing you! Thank you Ron, for your comment. We agree, and Josh was a great interview. We hope to see more great work from Josh going forward. @Jorge Uriarte: precisely. We (as grownups) really never stop learning, right? Congratulations Josh! It’s a very insightful interview that tell us what drives our brother in Chirst. God bless you!